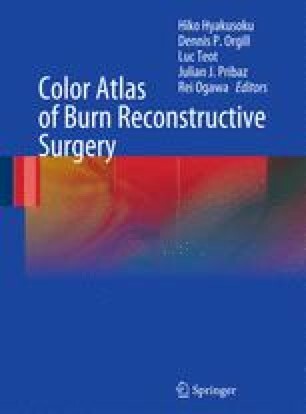 Patients with post-burn scarring frequently request help in improving the aesthetic appearance of their residual cicatricial deformity. It is their hope to eradicate the physical evidence of a scar and to re-establish a normal appearance and texture to the site of injury. This quest has led to the application of many different topical therapies which have included carbon dioxide (CO2) laser resurfacing, dermabrasion and deep chemical peels. All these modalities share a similar mechanism of action, topically ablating the skin in an attempt to yield a more homogenous surface. This therapeutic injury destroys the epidermis and the basement membrane. Ablating the epidermis of already scarred skin with subsequent protracted re-epithelialization may render the skin more sensitive to photodamage and dyschromia and may possibly cause additional dermal fibrosis by initiating a prolonged inflammatory response. Rejuvenation of scarred skin and re-establishment of a more normal appearance require the maintenance or establishment of a normal epidermis with normal colour and a normal dermis with natural dermal papillae, good hydration, and normal resilience.